Last Tuesday, March 18, the Fashion & Retail Society held our annual blogger speaker event where Noelle, founder and author of lifestyle and fashion blog Rue Le Chat, came to speak about Boston’s fashion scene. We love a Boston gal dedicated to bringing the spotlight to Boston’s fashion scene instead of taking the first Amtrak train to the fashion capital that is New York City. Noelle certainly delivered. Born and raised in Boston and with a family connected to Northeastern, staying here for school was an obvious choice. She has since fallen in love with Boston’s niche in the fashion industry and has never looked back. As a Northeastern alumna, Noelle shared the frustration of not having access to fashion classes at Northeastern and was able to give us valuable advice on how to find our place in the fashion industry here in Boston. 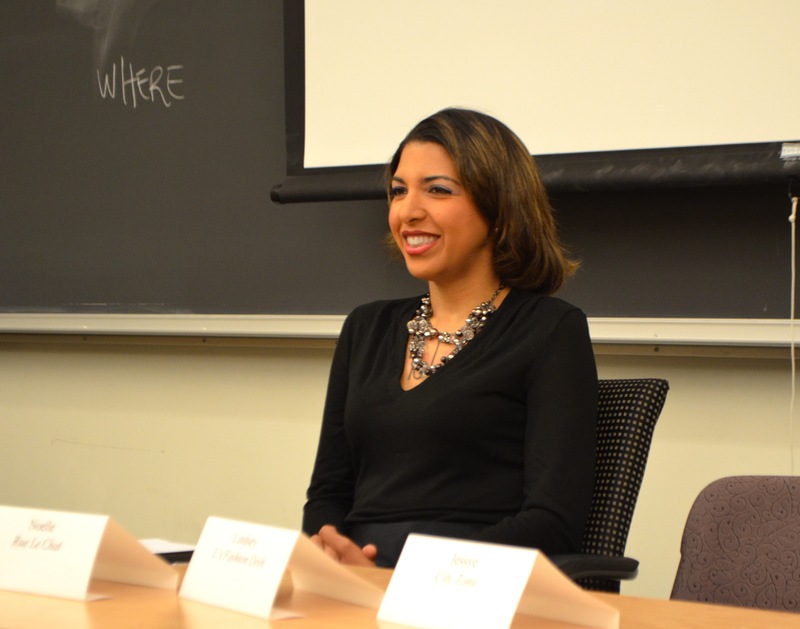 While at Northeastern, she spent time working for the Boston Globe where she gained experience in writing for a more traditional form of media. She loved writing for them so much that she stayed for three years after college and even freelances for them now on top of her full time job at Genzyme and time dedicated to Rue Le Chat. Although once employed in the television industry, Noelle admits writing was always her passion and what she was meant to do. A believer that everything happens for a reason, Noelle took her lay off from a job in television several years ago as an opportunity for self-reflection, which helped her find her way back to writing. Noelle may have a nine-to-five job that doesn’t allow for a lot of creativity, but she uses her blog as not only a way to share events she attends, recipes and fashion tips, but also as a way to meet really interesting people who share her love of fashion. Noelle mentioned a GQ article from several years ago that named Boston among the worst dressed cities. Obviously they didn’t see the plethora of style that passes through Centennial Commons on a daily basis! In response to the bad press on Boston’s fashion sense, Noelle described Boston’s fashion scene as a “boutique” because of the size and assortment of fashion influences here. She went on to explain that people underestimate Boston when saying it’s just college students and sports dynasties because there is rich culture here that is related to fashion. Noelle advised that when blogging you must “stay true to your voice even if you get negative feedback.” She admits that negative feedback is as much part of the process as positive feedback and just something you have to accept. Noelle added that even if you receive negative feedback, you will be fulfilled with your writing. “As long as you don’t lose your faith. Don’t lose the reason why you blog,” she shared.